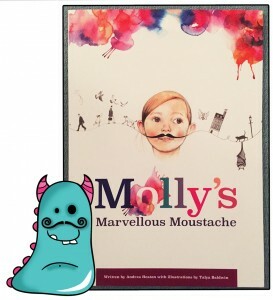 Molly’s Marvellous Moustache by Andrea Heaton and illustrated by Talya Baldwin was sent to Book Monsters HQ for review. I was keen to look at this book as the front cover looked full of fantasy, fun and, well, moustache! Molly’s Marvellous Moustache has been self published with the help of a successful Kickstarter campaign, and it’s been very nicely done. It tells the story of Molly, who, like many children I know, want to be grown up. In Molly’s eyes having a moustache will make her a grown up. Such a sweet idea and so true of how young children view the world. 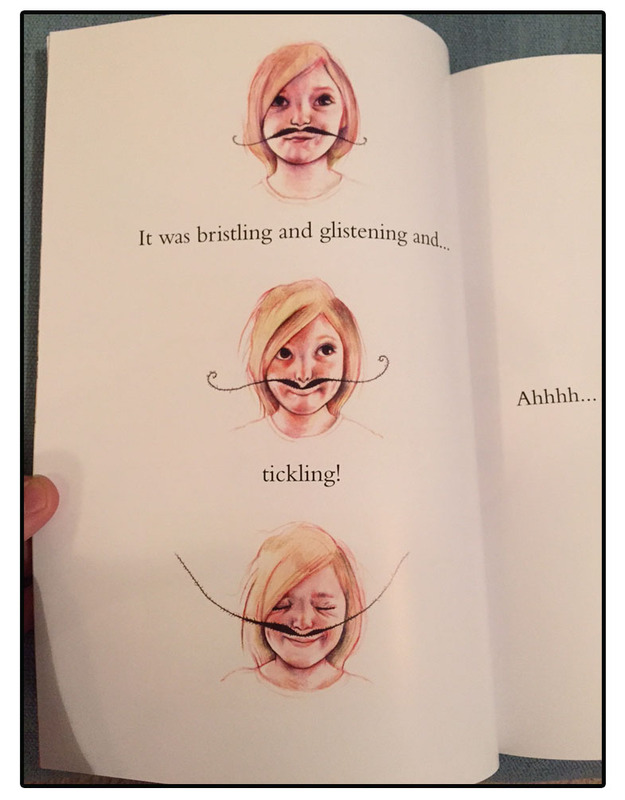 Molly’s Mum makes her a moustache and she wears it “for all day and all night”. The book is written from Molly’s perspective and the writing is lovely as it’s very much in the style of how a young child might speak so you feel like you are gradually getting to know Molly. Andrea’s wonderful words are supported beautifully by Talya’s illustrations which contain a mix of ultra realism, cartoony and abstract styles. I particularly enjoyed the images of Molly’s face, so full of character and again capturing children’s playful expressions so well. This page was such a favourite of mine, a joy to look at. 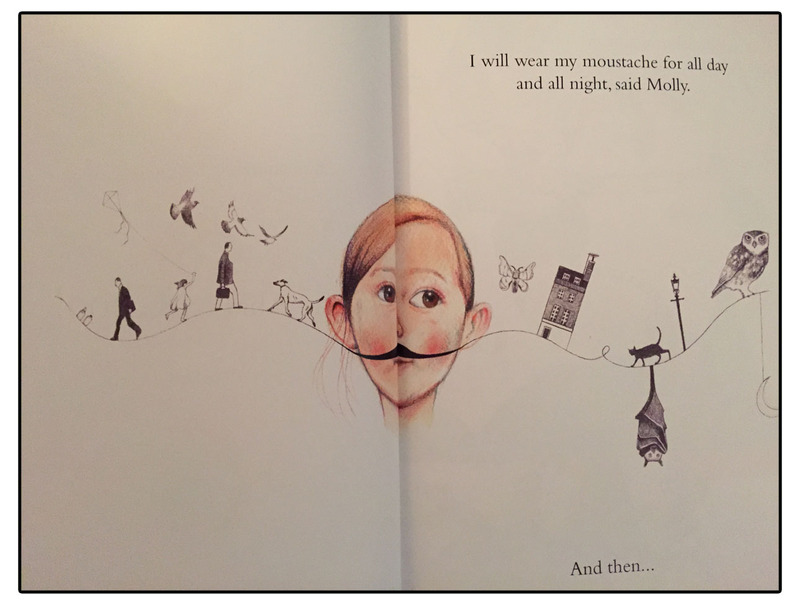 Molly’s magical moustache takes her on all sorts of adventures and she loves, for a while, feeling like a grown up. Molly soon learns that being an adult means she must eat olives, spicy food and worst of all, go to work. 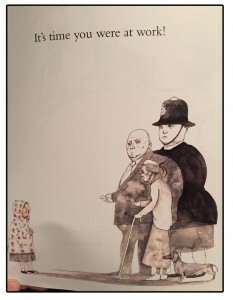 She soon realises that maybe her own life is more marvellous than a grown ups. 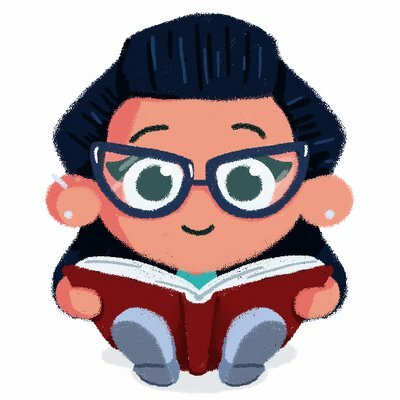 Andrea and Talya have done a wonderful job of creating this lovely book, and I hope we get to see more of their work in the future. 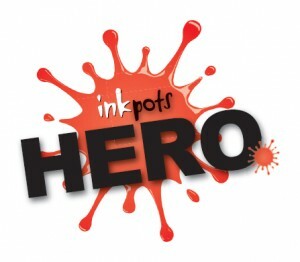 Thank you for reading this very grown up Book Monster review.